Geeky-branded cosmetic lines are slowly becoming common place. As a geeky girl, putting on makeup in the morning has become quite exciting. From L.A Splash debuting a set of Harry Potter lipsticks to Covergirls midichlorian infused line of limited edition Star Wars makeup, there is something for everyone. 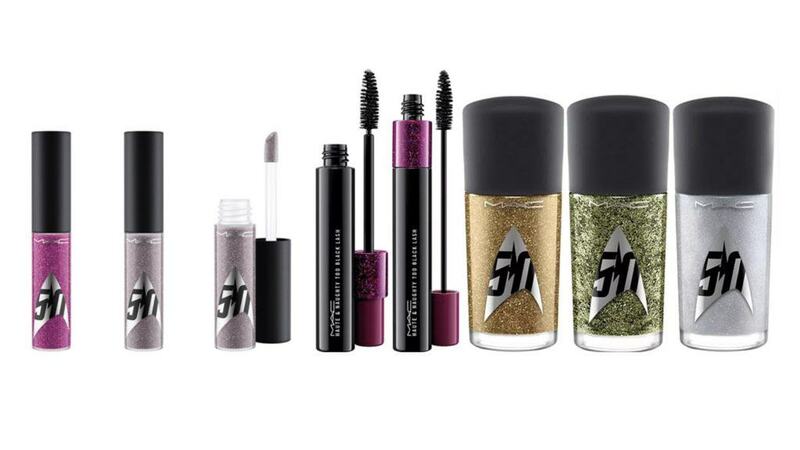 MAC Cosmetics has now dipped their toes into the realm of Star Trek makeup. To celebrate the space faring series, which is celebrating its 50th anniversary this year, MAC is giving all fans a chance to channel their inner Trekkies. Spock once said “After a time you may find that having is not so pleasing a thing, after all, as wanting. Its not logical, but often true”. Goodness! 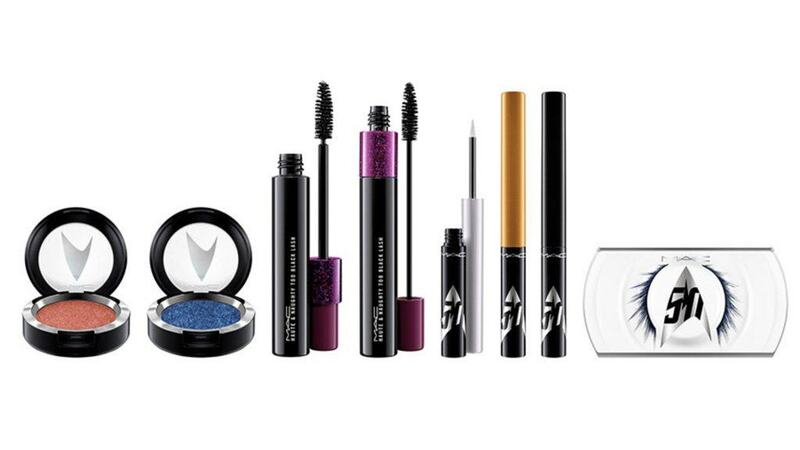 I wish I could get my hands on all of this Star Trek makeup. 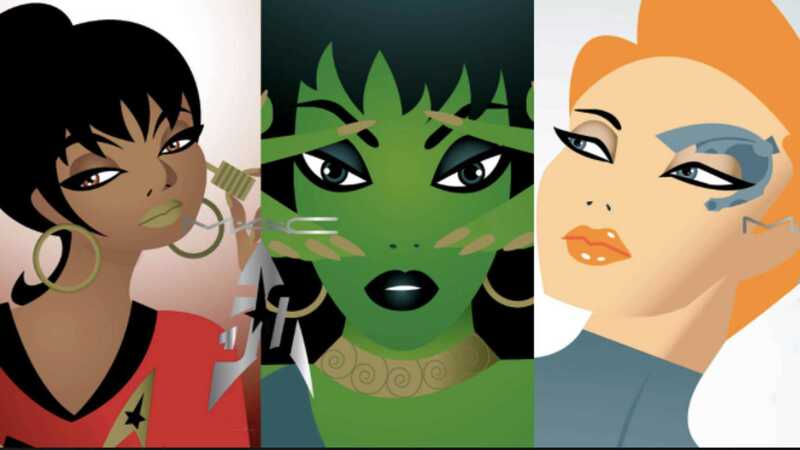 MAC’s new Star Trek makeup line is inspired by the cosmic female Star Trek characters like Uhura, Counselor Deanna Troi, Seven of Nine and Vina the Orion slave girl. The makeup line totals 25 products with the collection ranging in colour from metallic lip glosses to iridescent midnight blue eyeshadows and lipsticks. Perfect for when one needs to “boldly go where no one has gone before”. The product line also includes nail lacquers ranging from sparkly green, silver and gold, all with a spacey frosted finish. There are even unconventional eyelashes that could cause reaction similar to when Spock’s emotions were unleashed and fell into the arms of the lovely Leila Kalomi. In all honesty, I just want to smear the Star Trek makeup all over my face. In a bid to remain calm, I will just say “suq seymoH” (for those of you who are unaware, that means “excited” in Klingon and if you didn’t understand that, well then, friends, you need a Star Trek Movie-cation). The iconic popculture of Star Trek is timeless. It is also one of the few groundbreaking series that featured woman in roles of power long before the status quo thought to do so. As described by MAC’s Senior Vice President and Group Creative Director James Gager, the company’s aim is to commemorate the powerful female roles in the Star Trek films, who’s characters have inspired many woman. To complement the launch of the new Star Trek inspired MAC cosmetics, the company created several video tutorials so that everyone can achieve their favorite Star Trek look. Now anyone can look like Seven of Nine, Deanna Troi, Uhura and Vina. Next articleAre you ready to #EscapeToPlanetrAge?